Unicorn personalized lunch tote for toddler. Give a fun and functional gift to a little girl! 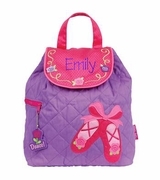 She will be delighted with the pink unicorn that gazes out from the front panel of our lunch bag. Her adorable face features a smiling mouth and long eyelashes. Two ears and a horn extend outwards at the top creating a three-dimensional effect and the soft tones of pink and purple make a totally girly setting. 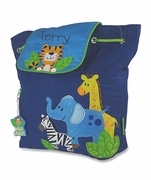 The bag has a main compartment and a separate lower section, both opening and closing with easy-to-pull zippers, ideal for little hands.